This is a two-day conference designed to create dialogue and provide education, mentorship and networking opportunities that improve and raise awareness about issues of diversity and inclusion. The conference will also address how higher education professionals and student can support diversity and inclusion efforts and be supported as they work to meet diversity and inclusion goals. Registration Deadline: Wednesday, March 21 (No on-site registration available). Cancellation/Refund Policy: No refunds will be given once registration has been processed. *On-campus programs using transfer vouchers can call for assistance. To register by phone with a VISA, Discover, or MasterCard call Conference and Scheduling Services @ 618-536-7751. Register in person at the Conference and Scheduling Services office on the 2nd floor of the Student Center. Cash, check or credit card payments accepted. 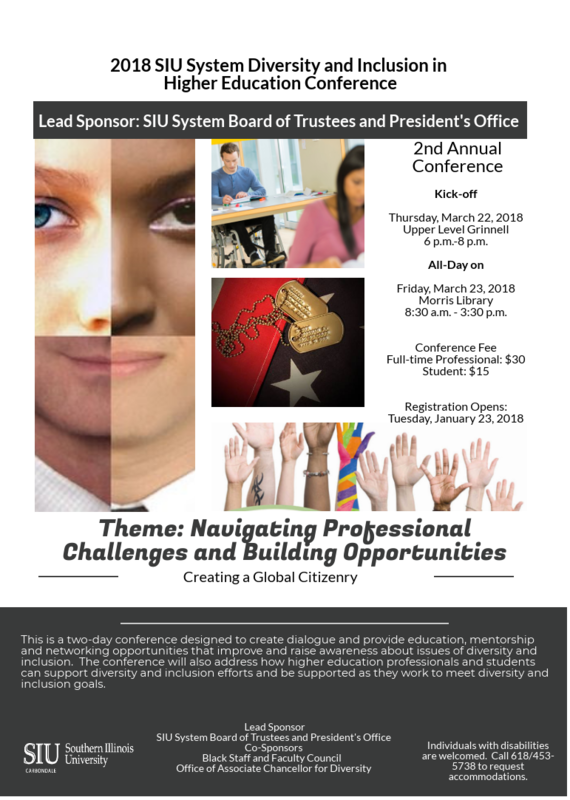 Please call Conference Chair Renada Greer at 618/453-6977 or email renadag@siu.edu for questions regarding the conference. Please call Conference Coordinator Leslie Brock at 618/453-1141 or email lagodwin@siu.edu for questions regarding registration.